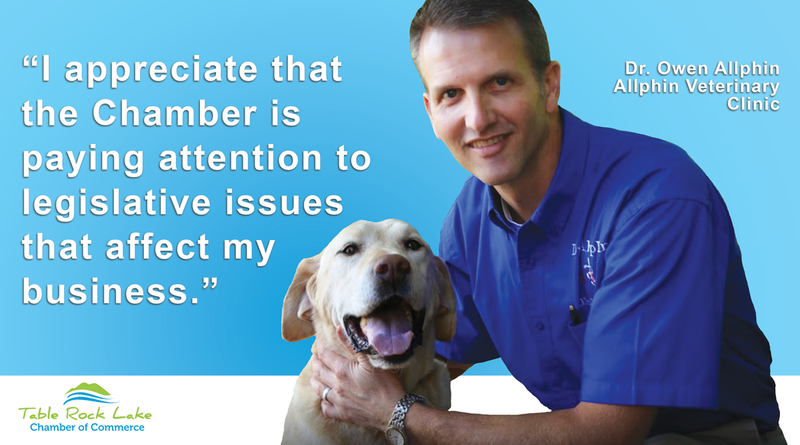 Dr. Owen Allphin owns and operates Allphin Veterinary Clinic in Branson West, Missouri. Allphin Veterinary Clinic is not a new business, in fact, it’s a successful business that’s been serving residents and visitors alike for 25 years. Early in 2017, Dr. Allphin was investigating new ways to market his business, and joining the Table Rock Lake Chamber of Commerce was one of the methods he chose to take his promotion efforts to the next level. Allphin Veterinary Clinic utilizes benefits such as Community Guide advertising, Hot Deals, website promotion, educational opportunities, and networking. One benefit that he wasn’t expecting was the Chamber’s advocacy for small businesses and tourism. The Table Rock Lake Chamber of Commerce is advocating, making YOUR voice heard at the local, state and federal levels. Just how do we do this? First, the Chamber of Commerce leadership creates and maintain personal, professional relationships with influencers and lawmakers so that we can help tell our collective story. The Chamber participates in a local legislative partnership and state associations that advocate for small business and tourism funding. Second, we pass along legislative information to our Chamber partners, helping to keep you informed. We cannot pursue these and other legislative priorities without the support of our Chamber partners, like Dr. Owen Allphin. Our Chamber partners give valuable insight, give their time for legislative activities and provide additional financial support. When businesses in Stone County work together great things happen! If you’d like to join the Chamber’s efforts call us, 417-739-2564.